Anguciana is a municipality within the autonomous region of La Rioja. It is in the northeast of the province. The district is under the local jurisdiction of Haro. 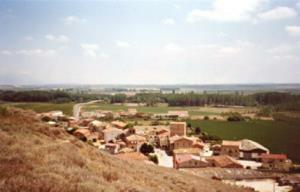 -Economy: The main activity in this municipality is farming, particularly grape production. 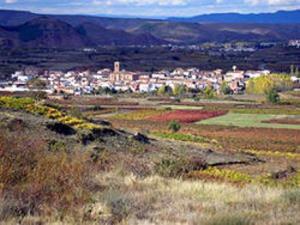 Anguiano is a municipality in the Upper Rioja area of the autonomous region of La Rioja, Spain. There are three neighbourhoods in this town: Mediavilla, Eras and Cuevas. 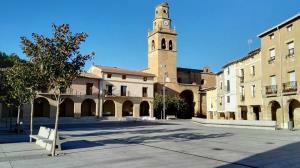 Mediavilla is the largest and houses the town hall, the San Andrés parish Church and many nobles' houses. Livestock farming is the traditional activity in the Cuevas neighbourhood, which houses the San Pedro Church. The River Najerilla separates Cuevas from Mediavilla and the two are connected by the Madre de Dios bridge. Eras is a farming neighbourhood where the majority of the village's barns were located, although there are several nobles' houses as well. The Aidillo gully separates Eras from Mediavilla and in the past, the Puentecilla bridge was the only way to cross this gully. 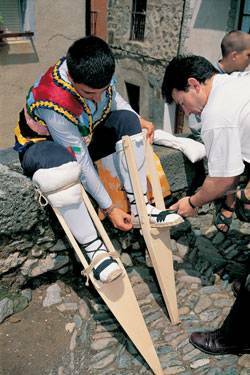 The village is famous for its dancers on stilts, which is said to be La Rioja's oldest folk tradition. -Economy: Livestock farming is the main activity, particularly goats, horses, cows and wool production. Tourism has increased in this area in the last few years. 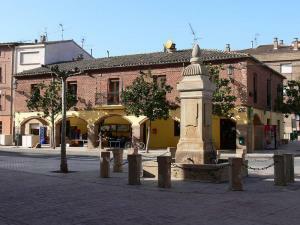 Arenzana de Abajo is a municipality in the autonomous region of La Rioja. -Economy: The main activity here is farming and the most common crops are grain, potatoes and grapes. -Economía: Predomina la agricultura de patata, vid y trigo. 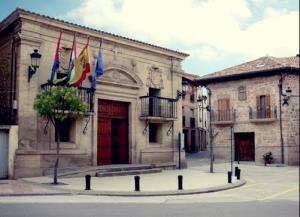 , Arenzana de Arriba is a municipality in the autonomous region of La Rioja. -Economy: The main activity is growing potatoes, grapes and wheat. The municipality's name has Arab origins and means the obligation of servants to work the Master's land in exchange for a small amount of money. In the 11th century, the area was called Azofra in the documents belonging to royal properties. As a reward for the help given in the war against his brother, Pedro I gave the town to Ortiz de Zúñiga, native of Navarre and Master of Cidamón and Montalvo. From then onwards and up until the 19th century it belonged to this family, the Counts of Hervías and Montalvo. Azofra is on the Way of St. James. -Surrounding area: The Santa María la Real Monastery in Nájera. -Economy: The main activity is currently farming and the main crops are potatoes, beet, grapes and fruit and vegetables. Land is also farmed in Nájera. 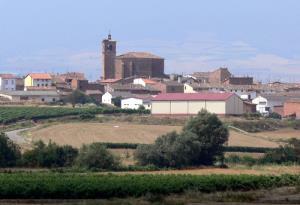 Badarán is a municipality in the autonomous region of La Rioja. 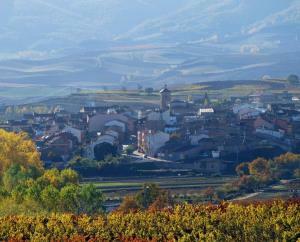 It is 37 km outside Logroño in the Cárdenas Valley at 623 metres above sea level. -Economy:The main activity is farming, especially potatoes and grapes. 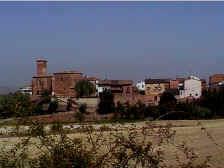 Bañares is a municipality in La Rioja, Spain. 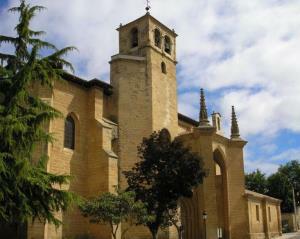 It is in the district of Santo Domingo de la Calzada, around 45 km to the west of Logroño. The main activity is farming. The main crops are potatoes, grain, beet and green beans. -Location: The town is part of the district of Santo Domingo de la Calzada. It is on the right bank of the River Oja. -Economy: This is a farming town that produced mainly potatoes. Baños de Río Tobía (also known as Bañuelos) is a municipality in the Upper Rioja district of the autonomous region of La Rioja. It is in the Najerilla River basin. The population is 1,711 and it has a large pigmeat industry. -Economy: The main activities are wool production and cattle and pig farming, upon which the pigmeat industry is based. Farming also plays an important role, especially wheat, grapes and fruit and vegetables. Baños de Rioja |90x108px|Coat of arms of Baños de Rioja]]Archive coat of arms: Square - Baños de Rioja. JPG Town square. Baños de Rioja12x12pxBaños de RiojaLocation of Baños de Rioja in Spain. Baños de Rioja12x12pxBaños de RiojaLocation of Baños de Rioja in La Rioja. Country 20px Spain • Autonomous region 20px La Rioja • Province 20px La Rioja • District of Santo Domingo de la Calzada Location 42°30'43?N 2°56'42?O? / ?42.51194, -2.945Coordinates: 42°30'43?N 2°56'42?O? / ?42.51194, -2.945</td></tr> • Height 549 metres above sea level</td></tr> • Distances 53.4 km from Logroño 60.7 km from Vitoria 75.3 km from Burgos 138 km from Pamplona 144 km from Soria</td></tr> Area 9.23 km²</td></tr> Settled in around the 11th century </td></tr> Population 96 inhabitants (2012)</td></tr> • Density 10.4 inhab. /km²</td></tr> Post code 26241 </td></tr> Mayor (2011) Jesús Ruiz Quintanilla</td></tr> Budget 291,531 € (2009)</td></tr> Website: www.banosderioja.org</td></tr></table> Baños de Rioja is a municipality in the autonomous region of La Rioja. 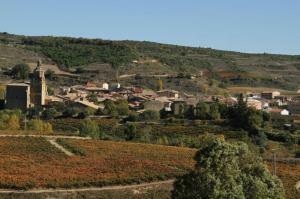 It is in the Upper Rioja region, on the left bank of the River Oja, next to the El Castillar Hill. -Location: The town is part of the district of Santo Domingo de la Calzada. It is in the Oja Valley. -Economy:Irrigated framing is the main way of life in this town.